Sage Taylor, who plans to study plant science, brought a couple specimens to her residence hall at Stevenson College. Malik Adams said he plans to study computer science, given his strong interest in technology. Download an infographic about fall enrollment. 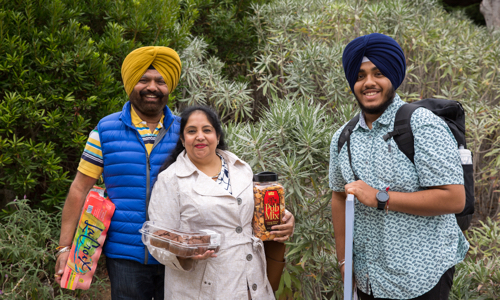 Holding a mirror and flanked by his parents, Harsewak Saini said he was drawn to Oakes College because of its legacy of having a multicultural community. “That’s my vibe,” said Saini, a Cupertino resident and his parents’ first child to head off to college. He’s looking to study computer science, after studying the subject in high school and tackling projects such as making Netflix recommendations. “I can make stuff from my own code. I like the flexibility,” Saini said. 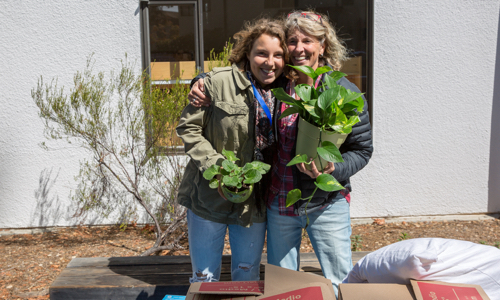 At Stevenson College, Sage Taylor placed two plants on a bench outside her residence hall. One was an African violet, and the other was one her mother recently purchased for her room. Taylor said she plans to study plant science. The Davis resident spent the summer away from home, interning in Yosemite for a business that takes people on hikes, before moving in at UC Santa Cruz. “I think it made this an easier, softer transition,” she said. Carrying a duffle bag into Stevenson College, Malik Adams said he plans to study computer science at UC Santa Cruz. “I’m very into tech,” he noted. Adams said he chose UC Santa Cruz because of its location and forested atmosphere—a contrast to living in Alameda. 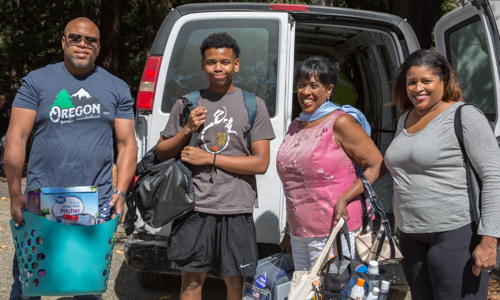 This past week, UC Santa Cruz welcomed Saini, Taylor, Adams, and an additional 3,675 freshmen and 1,768 transfers, who begin instruction Thursday. “This is an exciting year,” said Vice Provost and Dean of Undergraduate Education Richard Hughey. “The entire campus has collaborated to increase access to our campus through the transfer pathway, both in response to state priorities and as a result of our commitment to expanding this pathway to the university. Students are joining UC Santa Cruz at a remarkable time, with the campus finishing its new Strategic Academic Plan, offering a redesigned core course in the residential colleges, providing more training to foster an inclusive environment, and advancing in college rankings that underscore the university’s role in helping students and alumni improve their social standing. The Strategic Academic Plan identifies three academic priority areas— Earth Futures, Justice in a Changing World, and Digital Interventions—that will help give the campus a greater role on the international stage. The plan also provides new design principles for the campus and focuses on removing institutional barriers to research, teaching, and learning. The campus recruited 35 new faculty members this academic year, bringing the total number of Academic Senate faculty to 603. Their expertise both builds on existing strengths and will help push campus scholarship in new directions. Students this year will experience a redesigned approach to the core course offered at each of the 10 residential colleges, the campus’s renown communities of learning. UC Santa Cruz redesigned the class to focus on university discourse and shifted the writing requirements previously included in core to different courses. The core course is designed to prepare students for the UC Santa Cruz experience that’s grounded in critical reading, thinking and engagement. Each college will continue to offer a distinct course that aligns with its theme. For example, students in College Nine will look at international and global issues, while students in Cowell will center their course on imagining justice. All incoming students will take a new diversity, equity, and inclusion online program. The program teaches students about concepts related to identity, bias, power, privilege, and oppression, and discusses the benefits of being part of diverse community. The program was developed in close collaboration with student leaders. "This program is a positive outcome of students’ requests to best prepare incoming frosh and transfer students for our unique social-justice oriented campus culture," said Teresa Maria Linda Scholz, diversity officer for staff and students. "This educational program is also a result of the collaborative efforts of students, staff and administrators who have been committed to inclusive excellence." 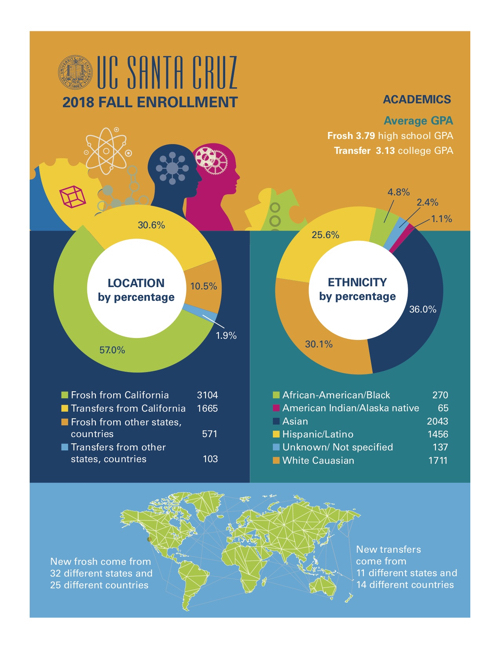 Incoming undergraduates show more ethnic diversity from fall 2017. African American/Black students increased by 12 percent (29 more students), American Indian/Alaskan Native increased by 10 percent (10 more students), and Hispanic students increased by 3 percent (42 more students). The academic profile of the incoming frosh remains very strong with an average GPA of 3.79 and test scores showing increases. Approximately a third of the incoming students will be the first in their family to earn a four-year degree. More than 3,100 of the entering freshmen hail from California with about 600 coming from other states or countries. The focus on opportunity and excellence helped to push the campus ranking higher in the annual U.S. News and World Report list. UC Santa Cruz is among the top 30 public universities in the nation. In addition to promoting social mobility, UC Santa Cruz is also dedicated to helping students pay for college. In 2016–17, 77 percent of undergraduate students received $278 million in financial aid. Additionally, 69 percent of UC Santa Cruz graduate students received $20 million in aid. UC Santa Cruz is providing campus housing to more than 9,300 students, about half of its student body. Through the proposed Student Housing West project, UC Santa Cruz plans to build more than 3,000 new beds on campus to increase housing options for graduate students and upper division undergraduates. Students moved in last week and have been busy learning about the campus through a series of welcome week events that continue into October.